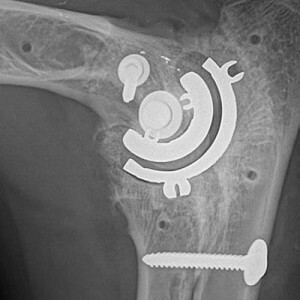 Canine TATE Elbow™ Replacement system developed by Sun Valley Animal Center’s medical director and owner, Randy Acker, DVM, combines ease of implantation with minimal trauma to the patient. BioMedtrix, a leader in the design and manufacture of veterinary orthopedic implants, has teamed up with Dr. Acker to produce this new total arthroplasty of the elbow, the TATE Elbow™. This new system is a minimally invasive resurfacing arthroplasty with milling based on the axis of the center of rotation. Today, the pet surgery can be completed in 2 hours with an 8-12 week restorative period for the patient’s full functional recovery. Teaching courses on the use of the TATE Elbow™ are now available and expanding throughout the U.S. and Europe. Over ten years in development, the impetus for the TATE Elbow™ was Dr. Acker’s own yellow Labrador retriever, Tate. Tate developed severe elbow dysplasia, and while Dr. Acker tried the common treatments of injections, arthroscopic animal surgery, acupuncture, and pain medication, the outcome was unsuccessful. Ultimately, the TATE Elbow™ System became the eventual result. Dr. Acker is now performing the TATE Elbow™ Replacement System routinely at the Sun Valley Animal Center. For additional information or to make an appointment, please call 208-726-7777.